With EcoGestor proveedores the companies working with you will fill in a checklist sent by the Organization. The Organization will perform the evaluation of the providers in a quick and easy way. Creating and setting up a checklist:depending on the characteristics defined by the manager, different checklists can be generated for the evaluation of providers. Sending e-mails withchecklists to the providers that do not have access to ecogestor. Controlling all the providers implies a high amount of time, due to the number of variables present in the analysis of distributors, contractors, suppliers, etc. 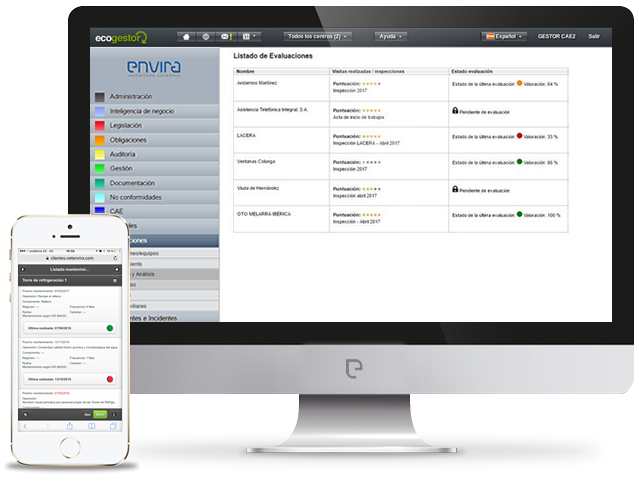 EcoGestor Proveedores automatically integrates the evaluation questionnaires and the in-situ inspections with an advanced system to interchange information. This means saving time, which implies saving money. It also involves easier decision-making processes, thanks to the graphic display of all data in an integrated way. Con el software EcoGestor Proveedores, podrá reducir el tiempo empleado en el proceso de evaluación de los proveedores debido a sus características. Saas technology (software as a service). It does not require the installation of external components. Automatic e-mail alerts are sent to contractors and managers about all pending matters. All the help to implement the software. Software adapted to three languages so that it can be used by companies from other countries. The software complies with the standards established in the personal data protection law. Advanced "on-site" tailored trainings about the handling of the application. Although the handling of the software is very intuitive, sometimes our clients want to optimize the tool and are thankful to receive training in their own settings.